"'Please'---Corinna sounded so weak---'I can't go back there. He hurts me. ''Well, give him a daughter and then he won't anymore. "Since a very young age, I was weaned on a mixture of fantasy, fairy tales, and history. In my native country, a well-known tale based on actual history concerns two sisters who rebel against their upbringing and fought against the Chinese for freedom against imperial rule. I was raised on these tales. I grew up reading about girls who just want more than what society and their family would want them to have. Princesses, commoners, it doesn't matter. Be it Princess Jasmine, the Trung sisters, or Mulan. Real or fictional, these girls have always sought more, they know there is another life for them outside of the boundaries that ordinary life has set. They don't want to get married right out of adolescence. They want education. They want to explore the world beyond their narrow village. Even lacking the traditional education that men have the privilege of getting, these girls are intelligent; street smart or book smart, they use what they have to strive for their dream. This is the background to which I refer as I delve into this book, and that is what made this book so utterly insipid and jarring to me.In the future, the United States is no longer comprised of states. A series of wars has left the country irreversibly and inexplicably changed, to the point where I can draw the similarities between the future US and the situation in some Middle-Eastern countries. It is a really strange, topsy-turvy world that had me shaking my head as I read and learned more about it. As opposed to most societies in history, the futuristic United States value girls and boys are thrown away. You know in China and India, to name a few countries, who kill and abandon their girls because they're perceived as worthless? Not this version of the US, but not for the reason you would imagine. Girls are prized because they are quite literally valuable. Wives are expected to give birth to a girl, since only then will they bring value to a marriage. Of course, it is the women's fault if they can't have a daughter.You see, when a girl comes of age to be married, she is entered into The Registry, the history of which is slowly exposed throughout the book, and a bride price given. Girls are literally prized since birth for the money they will eventually bring in. Boys, on the other hand, are unwanted, abandoned at birth. Why? They're destined for a future in the military, and nothing much more. Military enrollment is required, there is no opting out of it, and there is only ostracization and death outside of it. Boys are worthless to a family, since they're eventually going to leave for service without contributing anything to their family.Ironic, eh?Our main character, Mia, is dumber than a bag of rocks. I have to give her full credit for her ignorance, because she was deliberately raised this way. She is innocent and ignorant in every sense of the word; female and male contact outside of the family is forbidden. It is unusual for a girl to be educated outside of finishing school, and higher education is out of the question. Mia has been given the barest of knowledge she needs to be literate. She cannot even do math. She has no access to a computer, is forbidden to watch TV, and has been raised since birth to look forward to a blissful marriage to the highest bidder. "She'd grown up thinking her first kiss would be with her husband, an American hero who had served his country and was ready to dote on her nonstop, someone who was respected by everyone around him, and whom she was eager to serve. They would settle down in a small town where the two of them would be the most famous couple in the area, he for his bravery and Mia for her looks." Bidder? Yes, bidder. 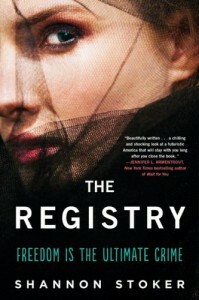 The Registry gives every girl a value. Mia's is an exceptionally high one, of $500,000, which confuses me a bit. Even these days $500k is not getting to be so much money, and hundreds of years in the future? Did the author forget to adjust for inflation or something? That value is higher than all of her sisters combined. Mia will make her already wealthy father an even richer man. Mia is stunningly lovely, and remarkably stupid through her lack of education. She thought her ignorance would lower her price---it only increases her value. "She flipped to the first question.1. What is 80% of $20.00?Math? Mia had never studied math, so she had no clue how to answer this. "Initially, I saw red when I read about Mia's ignorance. We first meet Mia as she sees her sister Corinna again. Corinna has run away from her abusive husband; emaciated, beaten, broken. Mia's reaction? "'Did you do something? Were you a bad wife?' Mia asked, still confused. 'William did this to me, after my son was born. He said I was a bad investment. 'The muffled sound of her parents walking toward the door stopped Mia from asking any more questions. Husbands didn’t hurt their wives. Husbands protected their wives. "Before she is forced to leave, Corinna shows Mia an article from an UK magazine she has hidden away concerning the "slavery" of American girls. Here's where I found things unbelievable. Mia has been programmed to be a good little girl who will be a good little wife her entire life, then after reading one article, she completely changes her outlook? People do not change that easily. Mia does, within a few pages. I want to give her credit for this change, but it is too sudden to be credible. She forms a truly harebrained scheme to run away from home, dragging along her book-smart but otherwise frivolous friend Whitney, whose dream is to get married, but whom nobody wants because her price is so ridiculously low. Why? She's been edumacated!!! She can calculate percentages!!!!! !It truly is a harebrained scheme. Mia sets out for Mexico, not knowing any clue how to get there. She figures they can reach the borders in a few hours. Her problem? She's from the currently Midwestern States. Even I can't drive that fast. She blackmails a reluctant farmhand, Andrew into helping her, falling in love with him along the way.Poor Andrew. He is such a straight arrow. He has been fully indoctrinated by propaganda to the point that he can barely think for himself. It has been drilled into him since birth how his life should be lived, and he is determined to pursue his path until he is dragged into Mia's idiotic scheme. "He knew the dangers of being seen with an unmarried girl, had heard stories about unserved boys who were stupid enough to get caught up in a pretty face---someone they didn't deserve to have. He wasn't stupid and he wasn't taking any chances. It was almost his time to serve, and once he was discharged he would be ready for and deserving of female companionship. For now, the only love in his life was for his country. "I'm not quite sure how to classify their romance, if it can even be called romance. Andrew is dead set on resisting the beautiful but terminally foolish Mia, and Mia can't help her attraction to him, despite knowing that he's in trouble because of her. She places them in danger more times than I can count, and Mia and Whitney's behavior are so childish that I can't help hating both, despite their effort at escaping a lifeless existence.The bad guys in this book are a joke. There is Mia's father, the personification of Scrooge McDuck. In one scene, he sits there counting his piles of money. Mia's "husband," the man who bought her, is equally hilarious. Grant is made to look so bad that he becomes a farce. Remember the swaggering, mustache-twirling bad guy? The cackling villain who goes around glaring at people and threatening them? Well, that's what Grant does. He randomly kills people whenever he feels like it. If someone pisses him off, he pulls a gun on them and fires off a few rounds. Someone else doesn't do the job? He pushes them off a helicopter. I'm not kidding. For a nation under such strict military control, it sure is easy to get away with randomly unpremeditated murder.The mystery of the Registry begs the question. Has the futuristic American society devolved so much that we can barely understand genetics and technology? Why are other countries so afraid of us, since it seems like most of America's been wiped out. There are a ton of plot holes, the characters are poorly written, and altogether one-dimensional and annoyingly stubborn and stupid. I'd give this one star, but the premise of a world where girls are valued is a fairly interesting one, and it did keep me hooked in that single sense.